The Real Family Of Axmouth Devon Uk - a Memory of Axmouth. My Grandmother ELLEN REAL was born in Axmouth 1875. Her grandmother was a Lace Maker and one of a few lace makers who contributed to making Queen Victoria's Wedding Veil. My father (William Tom Sparkes) told me all the lace makers who helped make the veil received an image of Queen Victoria wearing her wedding veil. This image was sent by Queen Victoria soon after the 1840 Royal Wedding to all the lace makers who helped make it. This image was taken on the Queen's wedding day. 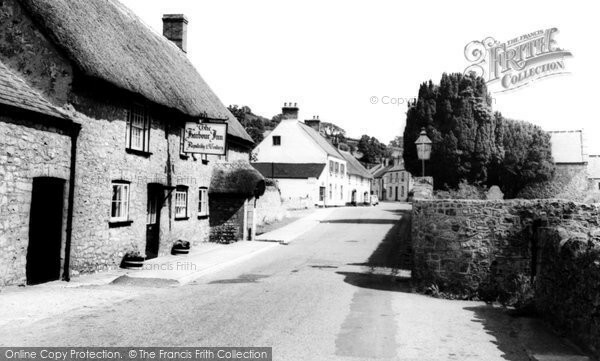 The lace makers lived in Axmouth, Beer, and possibly Branscombe. He remembers seeing this picture hanging up in his grandparents' home. His lace making great-grandmother eventually went blind. Her own story was that she was Spanish and had been washed up after falling overboard. She was about 14 years old and was attempting to smuggle lace into the Beer area, and couldn't get back to her own country. According to people's memory, she had beautiful long black hair at one time. The males smuggled whisky and hid it in the caves of Beer. These caves were my father's play area as a boy. The caves have since been sealed up. I was told by my Grandmother's cousin (whose mother was also a lace maker) that the lace makers would take their small pieces of lace to THE HARBOUR INN and sell them to someone who would come to Axmouth by horesdrawn Stage Coach from Honiton. This person would return to Honiton and sell the lace on to a dealer who would have taken the journey from London to Honiton by horsedrawn stage coach. Queen Victoria liked this lace and it became known as Honiton Lace, as that was where the major deal was done, not knowing it had been made in the villages mention. My grandmother ELLEN REAL was born in Axmouth. At one time she lived in Real Cottage with her parents Tom and Elizabeth (Clark) Real. She had two brothers Bert and Arthur. My grandfather Walter Sparkes also from Axmouth married her at the Gospel Hall in Axmouth. They were believing Christians and went on to have three sons. Her brother ARTHUR born 1886 became a popular preacher. In the 1930s he went into partnership with a Mr Walter Holton from Trowbridge. He was a baker and confectioner and they started a business together at Castle Cary Somerset. They named their bakery business "REAL & HOLTON". Mr Holton passed away suddenly in 1943 and Arthur Real retired 1946, handing the business over to his nephew (my Father) Mr W.T. Sparkes. In 1947 a Royal Wedding Cake was made by REAL & HOLTON of Castle Cary for Princess Elizabeth. A memory shared by Kay Foulger on Jun 28th, 2010. Send Kay Foulger a message. Add a memory of Axmouth.